1977-78 was the last time an Indian team had managed to win the fourth test of a series Down Under. 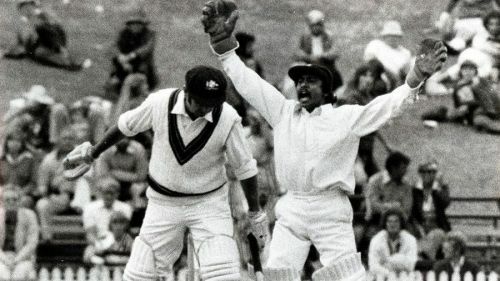 Last time an Indian team managed to win the fourth test in a series down under was way back in 1977-78 held in Sydney. Before the start of this test, Australia was leading the series 2-1. In the fourth test, Australia won the toss and elected to bat first. India won the fourth test by an innings and 2 runs to level the series. Key highlights from this test held between 7th - 11th January 1978 are as mentioned below. 131 & 263 was scored by Australia in their first & second innings respectively. 396/8 was the score at which India decided to declare their first innings. 85 by Peter Toohey was the highest individual score by a player in an innings in that Test match. 89 runs scored by Peter Toohey is the most number of runs scored by a player in this match. 4 half-centuries were scored in this match. 71 fours were hit in this match. 1 six was hit in this match. 6 wickets taken by BS Chandrasekhar is the most number of wickets taken by a bowler in this match. 4/30 by BS Chandrasekhar is the best bowling performance by a player in an innings in this match. 13 maiden overs bowled by EAS Prasanna was the most number of maiden overs bowled by a player in this match. Of the 28 wickets that fell in this match, 10 were bowled, 2 were caught & bowled, 12 were out caught, 3 were out LBW and 1 was out run-out. 2 dismissals (Ct - 2) by Stephen Rixon was the most dismissals by a wicketkeeper in this match. 2 dismissals (Ct - 2) by Stephen Rixon was also the most dismissals by a wicketkeeper in an innings in this match. Apart from the Aussie wicket-keeper, no other player managed to take more catch in the match. Australia would go on to win the fifth test by 47 runs and win the series 3-2.